Built in the early years of the 20th century, these villas have changed very little. Some of the front walls and railings have been removed to facilitate parking. The view is taken from the corner of Barrow Road, looking up Loughborough Road. The new picture shows the full block of six houses (on the right), known as Beacon Terrace, now numbers 31 to 41 Loughborough Road. The older picture shows just four of the block (35 to 41). 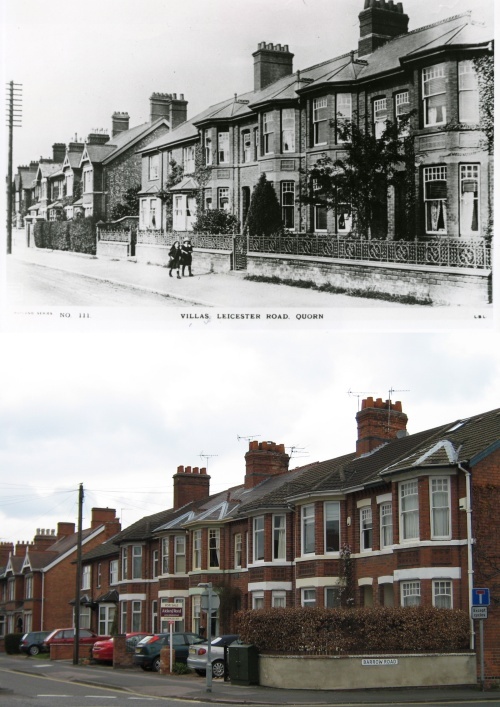 Note that the postcard showing the older photograph has been wrongly captioned 'Leicester Road'.